Is your bedroom closet an embarrassment? Shoes stacked in a heap on the floor. Clothes smashed together like sardines in a can. Dead space above the single closet rod and shelf at the top. Dead space below your blouses. Getting ready is a major stressor. Desperately trying to get the kids on the bus on time and you can’t find your favorite pumps for the meeting is not the start of a good day. The question is, how can you get control over this mess? The key to solving the massive design mistakes in a bedroom closet is to recognize bad design, then put a plan (or custom closet redesign) in place to fix the problems. In this article let’s look at 5 common errors in bedroom closet design and give you strategies to fix them once and for all. Most closets are as overcrowded as your favorite department store running a year-end blowout sale. However, the biggest problem (if we’re being honest) is too much stuff. Jeans two sizes too tight. Out of style blouses. Jackets missing a button. You still own the floral baby doll dresses you loved back in the days when Beverly Hills 90210 was popular. When your closet is overcrowded it’s impossible to find ANYTHING! An improved closet design begins with decluttering. If you find parting with your clothes and little-worn shoes feels like you’re ripping your heart out, get help from a professional organizer. They are training to help you purge. The challenge of too much stuff is personal, but closet problems go beyond clutter. The challenge of too little space (in most cases) is structural. 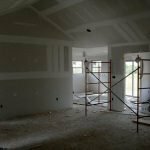 You may be asking, what do you mean by structural? I’ll be frank here. Most closets are designed to fail those using them. Instead of having one rod at the top, go to 2 rods in the same vertical space. It will instantly double your storage. Did you know you can store 2x as much stuff folded on edge in a drawer as you can hang up? With drawers, you gain storage, and the closet looks neater without hanging clothes staring you in the face. Fixed shelves (especially those places too high for you) are of limited use. A custom closet system with adjustable shelves is designed around you – not around some ‘generic person’ when the closet was ‘slapped in’ by the builder. Massive Mistake #2 – Shoes on the ground, shoes on the ground, how you gonna get ready when you can’t find your shoes on the ground? Whatever ‘dull as dishwater’ builder thought shoe storage wasn’t important hasn’t walked a mile in your shoes (pun intended)? Over the last 5 years, the number of pairs of shoes we own has grown by 25%. You have ballet flats, sneakers, pumps, espadrilles, knee-high boots, sandals, and rainboots to name few. Having your precious shoes dumped in the deep dark corners on the closet floor (buried under hanging clothes) just ain’t gonna cut it in today’s world. If you’re looking for a cheap-fix, over the door shoe organizers can work. 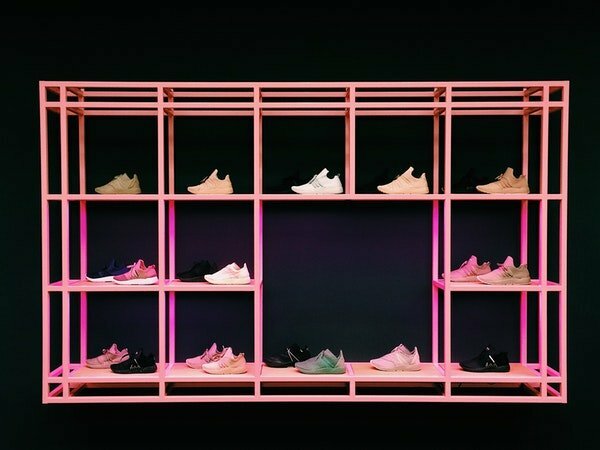 If you’ve got a lot of space – and want a ‘Neiman Marcus, Kim Kardashian-esque” display, raised shoe shelving is a fashion-forward must. If your space is limited (more often the case) adjustable flat shoe shelving which can be raised or lowered to fit the height of your favs is best. A jumbled mess. Let’s call it what it is. Most closets are a disorganized jumbled mess. There is no ‘game plan’ of what goes where it’s just a bunch of clothes cramped together. This is a massive mistake which can (and will) elevate your blood pressure. You’ll see this when you can’t find what you need and you’re rushing around trying to be ‘Super-Mom’ as life’s balls are dropping like hotcakes. There is a simple way to get your arms around bedroom closet storage. First, pull EVERYTHING out of the closet. Yes, you heard me right – everything. Sort long hanging clothes (gowns and dresses) in one spot on your bed or bedroom floor. Sort your jackets in another area. Sort your blouses and jeans in another. When you bring your clothes back in, place all the long-hanging clothes together in one spot. For most women, these are worn the least – so putting them in the back corner or behind an inswing door makes sense. Put your jackets (also called medium hanging in the custom closet industry) into another spot. Lastly, put your blouses and jeans (I’m assuming now you’re folding your jeans over on a hanger) into the ‘prime real estate’ spot (front and center) – since they are used most frequently. If the closet is still overcrowded – get a temporary storage unit to store in your basement for out of season clothes. Note – this is a good idea in concept, but most people will lack the discipline to do it. I would revert to the mistake #1 recommendations and get rid or more things. For a permanent solution invest in a custom closet organizing system which creates sections built around long hanging, medium hanging and shorter hanging clothes. Do you ever feel like the corners of your closet are the ‘Bermuda triangle?’ They are where clothes go to die. Hanging clothes on one side pushing against hanging clothes on the other side. 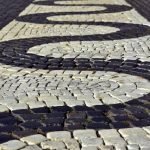 It causes you to find – nothing! This type of closet corner design is a disaster. There are 2 simple ways to solve this design dilemma. First, install corner shelving which separates (it sounds like what you need to do when your kids are fighting) the hanging clothes on one wall from the hanging clothes on another. The corner shelf can serve as a place for folded sweaters, your favorite fashionable purses or fun shoes. The second solution is to run the hanging clothes on one side fully into the corner and then put a stack of drawers on the opposite wall. Drawers add class and sophistication to a closet. They also give you the advantage of increasing storage capacity vs. hanging anyway. Did you watch the popular show Storage Wars where items were auctioned off when rent wasn’t being paid on storage lockers? You may have also wished you could secretly auction off the mess in your partners closet when they weren’t looking. Exactly why do they still own 13 holy sweaters with their college fraternity logo on them anymore? Sharing a closet can be a pain. You want it neat. Your partner believes messy spaces are a sign of their intelligence, creativity and spontaneous nature. The challenge becomes how can you cohabitate this closet without killing each other first? Divide your closet in 2 with a set of drawers or shelves in the middle. You have your side, your partner has theirs. Sometimes when your side is as neat as a pin it will guilt them into getting their act together (sometimes not, but at least you can find what you need). Hanging clothes extend into the closet 22” and generally look messy (especially if you use a wild mix of plastic hangers or the cheap wire ones from the cleaners). 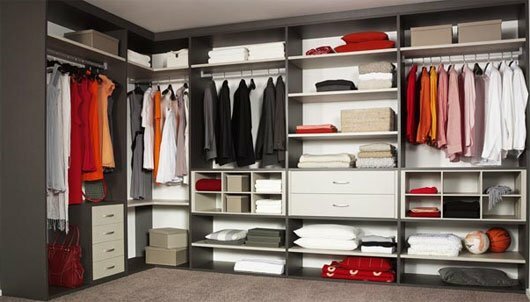 Reduce your hanging and in your new custom closet design install more shelving and drawers. Dirty clothes in a massive pile on your walk-in closet floor is disgusting and remind you of your boy’s bedrooms (we have 2 boys and have been there and seen that). Include clothes hamper into your design, or at a minimum get a concealed hamper so you can put it in the corner and minimize the smell of those tasty morsels. Despite the fact you use your bedroom closet a minimum of 2 times a day, in most homes the poor (or lack of) a coherent design is a source of daily frustration. Why deal with the hassle of a bad bedroom closet design? Get more organized. Get more strategic. Develop a coherent plan and reform this cluttered closet eye soar- once and for all.